Salvation And Survival: The Devil Unleashed ... Again! The Devil Unleashed ... Again! 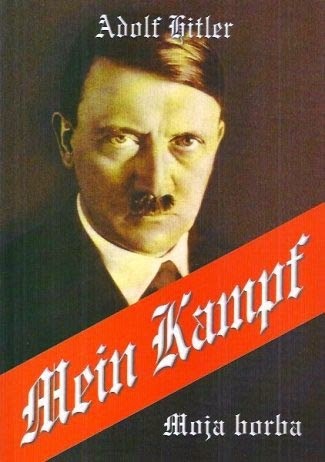 Who is really behind the decision to re-release Adolph Hitler's spurious publication, Mein Kampf? And who would possibly think that it is a good idea to re-introduce a book to a new generation that is on the brink of world war; a book that was the genesis for an ideology that resulted in over 6,000,000 deaths in concentration camps across Europe? Here are the purported facts, as written in an article at The New York Post ... The copyright for the 1924 Nazi tome is now held by the state of Bavaria in Germany, but will expire at the end of 2015. In January of 2016, Germany’s Institute for Contemporary History will publish a new, heavily annotated version of the Führer’s “My Struggle” autobiography. The Institute's Deputy Director was quoted as saying, "I understand some immediately feel uncomfortable when a book that played such a dramatic role is made available again to the public ... On the other hand, I think that this is also a useful way of communicating historical education and enlightenment — a publication with the appropriate comments, exactly to prevent these traumatic events from ever happening again." Here's my visceral reaction: Uncomfortable doesn't even come close to describing how I feel about this book being released to the public. And to say that it might be "useful to communicate historical education and enlightenment" is simply beyond belief! I could understand wanting to communicate the diabolical actions of the Nazi regime and "enlighten" the world some 70 years later as to the crimes and wickedness that emanated from Germany under Hitler's dictatorship. If that is truly your goal, wouldn't it best be served by releasing the millions of photos of Holocaust victims, or publishing a book by the remaining survivors of the inhuman atrocities perpetuated on Jews, Gypsies, Homosexuals, and "Undesirables"? Is reprinting "the Bible of National Socialism" really the best way to convey Hitler's demonic influence over the nation of Germany? And who will be making the comments, and from what perspective will they be "appropriate"? I'm sure I don't need to remind you that Neo-Nazism is on the rise, not only in Germany, but across Europe. Furthermore, the concept of Nationalism is once again gaining popularity -- the very instrument Hitler used to gain power. In fact, the modern devotees of Hitler's neo-Nazi, racist ideology have embraced Mein Kampf for some time now. So why give them a greater opportunity to revive the heinous movement? I tend to agree with Levi Salomon, a spokesman for the Jewish Forum for Democracy and Against Anti-Semitism, who said, "I am absolutely against the publication of ‘Mein Kampf,’ even with annotations. Can you annotate the devil? Can you annotate a person like Hitler? This book is outside of human logic." For those who would say that we need to remember the evil in order to reject it and spurn it, I would say this: Yes, we should never forget it, because to do so dishonors the victims. But there is a fine line between remembering in order to strengthen those who survived the horrors; and to remind us of how important it is to never let this happen again. But, there is something that is potentially alarming about this new publication. The original book was 700 pages long; the reprint will be 2,000 pages long, containing criticisms and analysis. This does not sound like a condemnation to me. Whenever you open the door for "academics" to theorize and comment, you take the chance that Mein Kampf can be spun and re-invented to represent a "softer" side of National Socialism and anti-Semitism. That is not to mention that it will be, effectively, a guidebook to the theories that led to the Holocaust. Remember, that before the Holocaust, the modern world had no picture of what such evil looked like. In fact, when Mein Kampf was first published, the Western nations dismissed it and ignored it. That was a mistake. But to promote it now -- and that is what I think will be the ultimate result -- is also a mistake. There are too many factions around the world that are embracing the Nazi's ideological theories, and I fear that this book could be useful towards furthering their goals. Make no mistake! It has always been Satan's plan to destroy God's chosen people; he tried to pollute the DNA of the Israelites to keep Jesus from being born; he tried to eliminate the Jewish race through the designs of Hitler, his emissary, during the Holocaust -- and he came so close that perhaps a second release of Mein Kampf can finish the job. Hitler's political theories of "Masters" and "Slaves", "False Religions", and his resultant goal of annihilating the Jewish race should not, and cannot, be unleashed upon the world. Can the nations not see that if we open that Pandora's Box again, that we will not be able to close it? Surely sanity will reign and the devil will not be unleashed once again upon the world! Ecclesiastes 12:14 "For God will bring every deed into judgment, with every secret thing, whether good or evil." I agree with you, but we must remember that the Plan is already written. Satan will never defeat God, and God will never allow his people to be destroyed. I know it's difficult to accept, but ultimately, this plays exactly into God's script for the end times...an increasing hatred for the Jews...again, an increasing acceptance of the idea that if Israel is eliminated, all of the problems of the Middle East will disappear. Nicole, I totally agree with you ... the Plan is written and God is the Victor! But my fear is that so many Christians are prepared for the persecution and hate that is coming until Jesus returns to claim His own. In the meantime, Israel will increasingly become the target of those who hate God. Pray for the peace of Jerusalem!